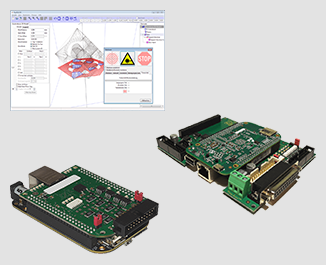 This package contains the software with included support for all hardware and can be operated with already existing controllers and machinery. It is shipped with an USB-dongle which provides the License to use RepliSLS3D with all its features and functions. 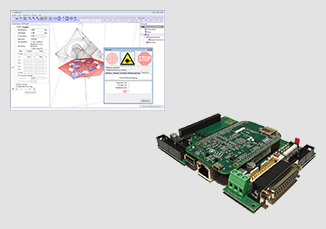 This package contains the software with included support for all hardware plus a fully featured laser scanner controller card which can be operated with all standard XY2-100 and XY2-100E scanheads, as well as with all common laser types. Contained 8 digital in- and outputs can be used to communicate with other external equipment. Beside this controller card, variant "FULL" it is shipped with an USB-dongle which provides the License for operating RepliSLS3D without limitations. This package contains the software with included support for all hardware plus a fully featured laser scanner controller card which can be operated with all standard XY2-100 and XY2-100E scanheads, as well as with all common laser types plus a four-axis motion controller which can be used together with a power driver in order to control up to four stepper motors (e.g. to shift Z-position, to apply material between slices, ...). The 8 digital inputs and 8 digital outputs contained in laser scanner controller card can be used to communicate with other external equipment. Both controllers are fully supported by RepliSLS3D software and integrate seamless into a typical production process. Beside the two controller cards it is shipped with an USB-dongle which provides the License for operating RepliSLS3D without limitations.